Morning service on Sunday was led by the Reverend John Smith, former minister at Morningside in Edinburgh and now living in Peebles. Earlier, another former minister and a member at Caddonfoot, the Reverend Jack Kellett, read Psalm 23, “The Lord’s My Shepherd”, translated from Hebrew to Scots. Music was played by Margaret Blyth and Anne Grieve. After the service there was a meeting of the congregational board, which approved plans for a church community event at Glenkinnon on Sunday, August 14, from 1-4pm. Bible study has been suspended until August, but the church is open on certain days – contact John or Irene Bruce for details. The Thursday lunch club gathering on July 14 started with a game of bingo. After lunch there was a quiz, with the winner being Anne Thomson. The service on Sunday, July 24, at 10.15am will be conducted by the Reverend Julie Rennick. Refreshments will be served afterwards. Session clerk Bill Cheyne welcomed the Reverend John Smith to conduct Sunday’s service. Margaret Blyth led the music, while Bill read the lessons. Bible study has stopped until next month. The Reverend Duncan McCosh returned for last Sunday’s services. Today (Thursday), sees holy communion (10am) and the study group (11am) followed by lunch. Sunday, July 24 – 9.30am, Sunday Squad, followed by tea and toast; 10.30am, sung eucharist, followed by coffee and chat; Thursday, July 28 – 10am, holy communion; 11am, study group, followed by lunch. Visitors from China and Norway were among those who attended the latest lunch club gathering. As well as regular supporters, the club is grateful to the ladies who stepped in to help cope with a shortage of staff. July 12 – 1 (equal), George Graham & Bob Francombe, Mary Millar & Patsy Gilligan; 3, Kenneth Auckland & David King. Jim Herbert has worked for Berwick Museum for the past 19 years and is the leading authority on the medieval defences of that town. He gave members an outstanding resume on the history of the castle and wall through the centuries, as well as the history of the times. The outcome was an enthusiastic question-and-answer session. Alan Graham gave a vote of thanks. The club is now in recess until the next meeting on Thursday, September 8, when the speaker will be Watson McAteer. Despite their lack of any great height, the Lammermuirs provided an exhilarating walk for the group, starting on the old route from Stoneypath Farm. Unwalked by most, the track was followed up past Moorcock Hall onto the ridge where fine views of the coast unfolded. Descending to Johnscleuch, an ancient fortified house, the group stopped for lunch just below the wind turbines of Crystal Rig. The Lammermuirs have an over­abundance of these structures, with their constant whirring disturbing the silent solitude. Once the group reached the Herring Road, the path was less distinct, but the walkers battled on through patches of cotton grass, occasionally brightened up by bell heather. Despite the lack of grandeur, the varied moorland was never boring with much to note. Boundary stones are clearly visible among the heather as a distraction from grouse-feeding stations peppering the landscape. Lauder kirk session chastised a parishioner for “going on the Herring Road on the Sabbath” long syne, but the 14 walkers were not to be thwarted. To reach Deuchrie Farm, the group passed by the empty cottage, Lucknow. Was a local at the siege? The origin of its name remains a mystery – for another day. If you have a garden to be proud of and bursting with colour, or know a friend or neighbour whose garden is worthy of recognition, why not enter yourself or nominate someone for this year’s Best Kept Garden Competition. The popular annual competition is run by Hawick Community Council, assisted by Hawick in Bloom representatives, and will be judged during the week beginning Monday, August 8. There are salvers to be won in the main categories, with certificates for those highly commended. The competition is split into four sections – garden, sustainable (low maintenance), business and allotment. Community council chairperson Marion Short commented: “This is the opportunity for amateur gardeners in the town to show what they have achieved this summer by adding colour in and around the town. Even those who have entered previously are encouraged to put their names forward again.” The organisers have pointed out that a garden need not be at kerbside, as any area at the rear of a premises can also be included, and by doing so gives permission for the judges to enter the property. Anyone who would like to enter or nominate someone for this year’s competition should write their name or entrant’s name, address and category of garden on a postcard or slip of paper, and hand it in to the tourist information desk, Heart of Hawick, Towerdykeside, by Wednesday, August 3. On Sunday, July 24, there are two services – 8.30am (breakfast, song and a story) and 10.30am. Results for July 11 are as follows: N/S – 1, V. Johnstone and M. Miller; 2, J. Urquhart and S. Graham; 3, H. Long and M.Weightman; E/W – 1, J. Bridger and G. Eglinton; 2, K. Jackson and O. Whillans; 3, S.Mclachlan and J. Portch. The strawberry teas event held at Kelso Old Parish Church on Saturday, July 16, raised £1,100. Organisers are grateful to those who helped, contributed to and supported the event. July 13 – match-pointed pairs – N/S – 1, Val Johnstone & Mary Millar; 2, Bob Stevenson & Annie Mitchell; 3, Dominic & Diana Alkin; E/W – 1, Joyce Thomson & Helenor Pratt; 2, Elinor Green & Caroline Sutherland; 3, Alison Ireland & Aziza Taylor. July 14 – aggregate pairs – 1, John & Marian Miller; 2, Michael Horwood & Alison Ireland; 3, Alison Darling & Mary Logan; 4, Dorothy Graham & Lynda Douglas; 5, Stuart Graham & John Urquhart; 6, Dominic & Diana Alkin. 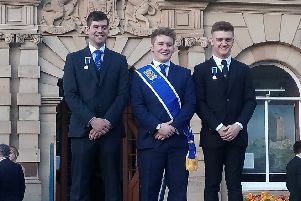 The first of the rideouts organised by the Castle Craigs Club prior to the Common Riding, has taken place. The pony rideout has been an added feature over the past few years when more youngsters learned to ride through the Young Riders’ Club. Participants – most of whom were led by an adult – started from the Kilngreen and went round the streets, led by the pipe band. Around 30 ponies and riders were headed by Cornet Simon Tweddle and his right and left-hand men, Jamie Fletcher and Dale Irving. Trust Housing Association, which owns Greenbank Court, has gained the excellence award in the third sector category, which is for more than 250 employees, at the Annual Investors in People awards. The category recognises organisations which are committed to sharing best practice and improving excellence in the third sector. The Tarras road, south of the town, has been closed since Storm Desmond last December. Community councillors heard that repairs were currently scheduled to take place between October and December, and could cost anywhere between £50,400 and £2.3million. The Eskdale Foundation has rewarded two of the town’s most successful projects for their efforts with £1,000 cheques. The Muckle Toon Adventure Festival, which has an annual event in June and the Pumpkin Run in October, and the Xcel Project, which runs activities for young people, fall under the foundation’s charitable objectives, which are education, health, leisure and recreation. The foundation, a community development trust, has been associated with improving sport and leisure. At Greenbank, it owns four houses and also manages the 15-house development. Foundation chairman is John Scott and the organisation also owns the High Street charity shop where all proceeds go to the community centre. Organisers are grateful to everyone who supported the community barbecue at Newmills Farm on Saturday, July 16. The total raised for church funds will be announced in due course. ing for a Cuppa” – the history of tea. Competitions – three meringues with cream filling and a tea caddy spoon. Sunday, July 24 – services at Bowden (9.30am) and Melrose (11am), the Reverend Brian Embleton; music society garden party at Gattonside (2pm). It’s the people one meets who make one’s day at visitor attractions – from a never-seen-before apparent fellow-graduate of 60 years ago to a couple celebrating their 70th wedding anniversary. Last Tuesday there was the pre-university lad all the way by train from Glasgow, keen to ‘do’ Trimontium and the abbey (and realising that Abbotsford would need another day).Thursday saw the remainder of the archaeology group from Lowick who came a month ago and were going back to do a little ‘dig’, under their tutor, to find out if there might be a fortlet where a famous local ‘diviner’ had suggested. The trust’s Antonine Wall trip to Bearsden is on August 6. The Guide Dogs coffee morning was held last Saturday when £400 was raised. John Mabon opened the event by giving a rundown of the past 40 years of Morebattle supporting Guide Dogs. Competition winners – guess how many sweets in the jar, Tamara Cook; pamper hamper, Darcy Weir; 50/50, Scottie Wight. Seventeen members and helpers went to Mayfield Garden Centre for afternoon tea on Tuesday for their summer outing. A joint service to be held in Morebattle Church on Sunday, July 24, at 11.15am will include the sashing of Lucy Thomson, this year’s Morebattle Games Queen. Jeanie McNulty is organising a sponsored walk from Sainsbury’s, Kelso, to the Templehall on Saturday, August 27, in aid of Breast Cancer/Borders General Hospital Macmillan Centre, starting at 2.30pm. Anyone wishing to take part should phone her on 440647. Sponsor sheets are available in the butchers and village store. The next service in Traquair Kirk is on July 31 (10.30am). The next service in Walkerburn Public Hall will be on Sunday, August 21, at 10am. There will be a traditional strawberry tea afternoon in the Wauchope Hall on Sunday, July 24, from 2-4pm. Entry is £5 and all proceeds will go to festival week funds. The community council is meeting on Tuesday, July 26, at 7pm in the Youth Hall.